IMG_0833_1 by 42937692@N03 is licensed under CC BY 2.0. Image may have been resized or cropped from original. Here is a note I just received from a woman (couple) living in Long Beach, Ca. that are considering relocating due to a job opportunity, and moving to Oahu. I came across your website about the pros and cons of living in Hawaii. Currently, my husband and I live in Long Beach, CA and I work for the Federal government. I have the possibility of transferring to our Hawaii office in Honolulu and we’re seriously considering it. I appreciated your write up about the pros and cons but I have a few more questions that would be great if you could provide some insight on. FYI – we are planning a trip to Honolulu in February to check things out (since neither of us have ever been to Honolulu or Oahu — I’ve only been to Maui twice previously). 1. Is owning a home really that difficult there? We own a home here in Southern CA so we understand high housing costs, but our house cost in the $400K’s and it’s a 3BR/2BA house in a nice neighborhood with some nice upgrades. Could we feasibly replicate that in Hawaii? We both have stable jobs that will be transferred over to Hawaii so we’ll be making roughly what we make here. 2. Island fever — how bad is it? The position I am considering might be a 3-5 year term appointment because we’re just unsure about things. We do a lot of things here in Southern CA, but we’re never taking off on road trips. Mainly we do outdoor activities, go to the movies, shop, bowl, etc. How big is Oahu really? 3. Cost of living – prices are high here in Southern CA — how much more are they in Hawaii? I understand that you probably get emailed a lot, but I would definitely appreciate any insight you might have! Thanks for writing. I do hope you pick up the Moving to Hawaii book for $5. It is filled with information that will help you come to grips with what a move to the islands looks like. For your first question, I would answer – no, you couldn’t replicate that on Oahu. You’d be missing something at spending that little for a 3/2… what you’d be missing is the nice neighborhood. It really is outrageous what the prices are on Oahu for homes. What’s funny is seeing signs that say how much a house is to buy as you drive past in the car. It will say, $400K, but it’s dilapidated and a one bedroom, one bath (1/1). It is totally outrageous. Hence the reason many families live together all as one – they cannot afford to go out and buy their own home. I didn’t think Kapolei was still this affordable. I knew Ewa Beach was, and that is where the majority of listings came from in the 400-450K price range. Kapolei is a nice little area, residential. They have the water park there now and it has grown quite a bit from 10 years ago, but still one of the nice little spots to live on Oahu – in my opinion. So to answer your question – yes you could replicate it, if you live in Kapolei. Ha! I would like to live in Kapolei, and many would – and do. Many others consider it too far out, away from town. It is a bit of a haul, but it’s one of the prices we pay for living in paradise. Do a Google map search for Kapolei, or if we’re lucky, the map below works. Island fever? I don’t think it’s a big issue. Especially if your job will be a short-term project like that. You have something to look forward to if you’re not liking the islands. Island fever hits people that can’t afford to go out and do something else. I used to love flying to the other islands for a break, it really does release something inside and resets the Island fever index, so I could stand some more time on Oahu. If you can head back to the mainland 1x or 2x per year, great. You likely won’t be affected at all. 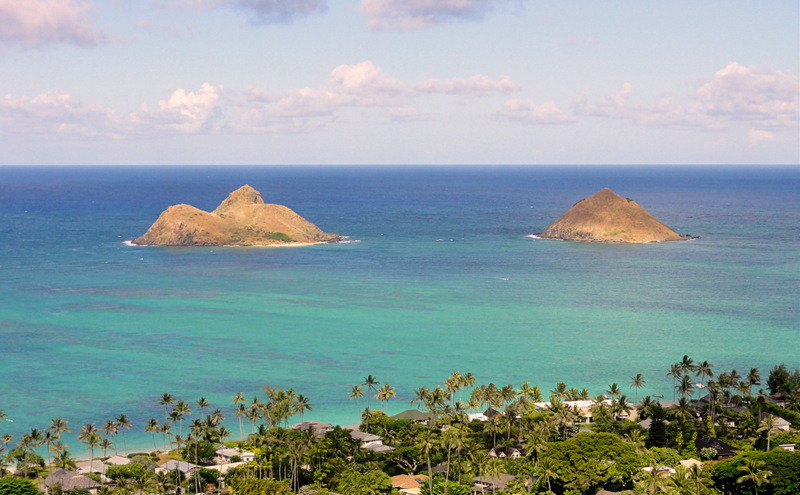 Oahu island is 597 square miles. Roughly 50 miles at the longest, by 30 miles. It takes hours to drive around the circumference, and the west side is impassable unless you have a jeep or other vehicle you don’t mind beating up. Outdoor activities – there are so many, you will be in paradise. I drove through Long Beach a couple times, taking my cars from Florida to L.B. to ship them over in a Maersk (sp?) container to the Hawaiian islands. Long Beach is pretty in spots, but Oahu is pretty everywhere. There are so many mountain peak hikes – I do hope you try some, it is an amazing way to spend the day. There are many beaches, some are even empty. Try little pockets of the North Shore in the morning – empty if there are not rideable waves. Bellows Beach. Waimanolo Beaches. Kailua. Chinaman’s Hat. Dillingham. Diamond Head. Wow, there are SO many places to go and see, you will find some that fit you and become a regular if you’re a beach goer. There are many parks and activities to try. I can’t see anyone that likes the outdoors – becoming bored on Oahu. Cost of Living on Oahu vs. Southern California? Probably the cost to live on Oahu is going to be very similar to what you pay in Long Beach. Maybe it is even higher for some things in California. You won’t notice any big differences. It will actually seem affordable to you, not like it would from someone currently living in Michigan and considering the move to Oahu. So, when you come to visit in February, have a look at Kapolei and see what you think. Kaneohe, on the windward side (north eastern side) is another alternative to look at, but overall I’d say the homes go for a little more there. It’s much more lovely a place to live though – IMHO. Kailua Beach is there… and it’s just a more natural (wild) setting. I enjoy the windward side a lot. Ok then, I hope that helps. Would you write me a follow up email later, after you go for a visit – and tell me what you think? My wife and I are 77, living in Los Angeles for 30 some years. We have pension income and social security totaling about $6,000 a month. We have good saving in case we need We want to buy a small, low budget condo in Honolulu area or its surrounding. We love oceans and lot of tourists where we live. We can live within our means even if we know that cost of living is very high compared to that of California. We may need or no need a car. We are older people and we have Medicare and supplemental health insurance. We just want to enjoy our golden years near the beaches. I request your advice whether we should move to Hawaii? My choice island is Waikikiki, Honolulu. Thank you very much for your valuable time and consideration. Ha! I am from Long Beach also and looking to make the move to Hawaii. First of all, I have some distant relatives currently living in Oahu. I have NEVER been to Hawaii. I am going by what my relatives are telling me and it sounds like the perfect place to appreciate life opposed to this rat race in SoCal. My biggest concern is that I do online marketing for a living. I have searched every single day on indeed, craigslist, and linkedin for jobs in that field. It feels like there are very few to really no opportunities at all. I have read your article on 10 steps to a job. This is the only thing that discourages me from making the move. Aside from the career aspect, everything else makes perfect sense to move (even your quiz says so lol). I have enough savings to last me 6 months of living in Oahu, based on the rent price I have already been offered and some cushion for food/ entertainment. I am career driven and honestly do not want to force myself to work in jobs outside of my field. Do you have any advice Peter? 1st: make sure you’re on my email list. 2nd: if you’re an online marketer I would think you could get jobs that may be outside Hawaii. That said, my upcoming program will include a job placement component so make sure you’re on the list. Great, I’m on your email list and look forward to the job placement component.